I started messing around at the tying bench a few months ago with some Puglisi flash brushes. Many fly fishermen use a fly with a rabbit strip or marabou tail with an estaz body. The Marabou Estaz is a good example. 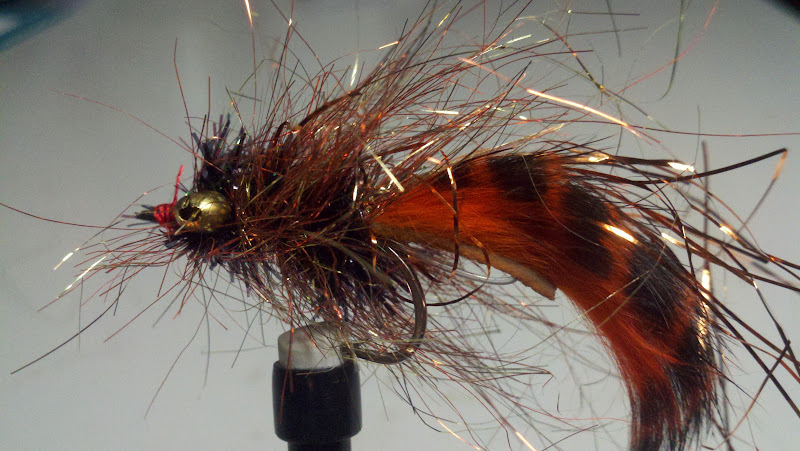 Click on the link for instructions on tying this fly. Other fishermen like the flash of the original Copperhead by Capt. Randy Hamilton. The Chernobyl Flash Bang combines all of these ingredients with the enticing flash of flashabou and a Puglisi Flash brush. The fly is similar to the Flash Bang Series tied by Capt. Honson Lau. I showed him the fly, and he said it looked like a combination of the Flash Bang and Chernobyl Crab flies. Hence the name, "Chernobyl Flash Bang." It is a bright, flashy fly that attracts a lot of attention from red fish when the water is murky. It is easy to tie and very durable. 3mm copper bead chain eyes. 1. Attach bead chain eyes with figure 8 wraps. 2. Attach a loop of 40 lb mono to the top of the hook bend for a foul guard. 3. Attach the barred rabbit zonker strip so it extends behind the fly the length of the hook shank. 4. Tie in six to eight strands of flashabou on each side of zonker strip. 5. Attach Estaz and Flash Brush at rear of fly. 6. Wrap a tight body with Estaz. Figure 8 over the eyes and tie off in front of eyes. 7. Palmer flash brush over body, folding the fiber back taking care not to trap fibers under succeeding wraps. 8. Tie off flash brush behind eyes. 9. Attach weed guard if desired. 10. Wrap a neat thread head and finish with head cement or thin super glue. That's it. This fly is simple to tie and very durable because the flash brush is made from stainless steel wire. You are in essence palmering the body with stainless steel wire. Tie for your next red fish trip and send me some pictures!!! Capt. Dave with a red fish caught in the surf. 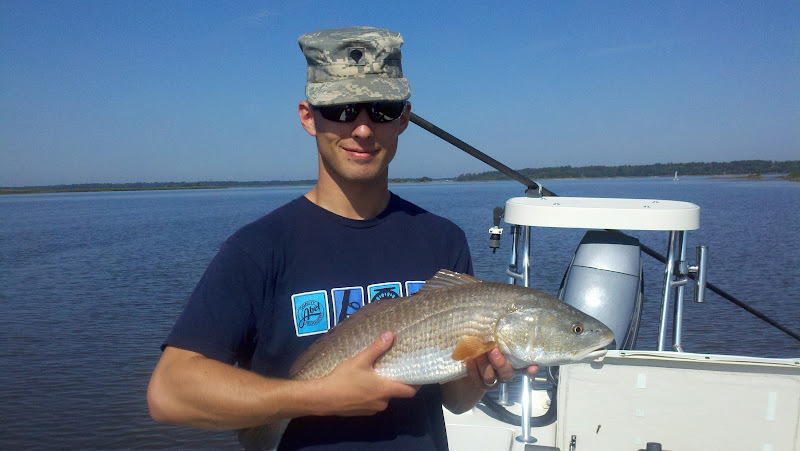 click on the link to see how fabulous the fishing can be in SSI during the winter. My surf fishing experience is limited to fishing with bait for red fish off of Pelican Spit and the middle bar off of Little Saint Simons and some surf fishing over thirty years ago on the Outer Banks in NC. Needless to say, I am a novice fly surf fishermen, so my expectations were low. I met John about four hours before high tide on the beach near Jacksonville. We had about a two mile hike to the top of the island where John said he has been surf fishing for reds for years. We had mild winds, bright skies and calm seas. John said, "We are going to catch fish today." We began by walking the beach looking for fish just beyond the surf line as well as blind casting into troughs. Blind casting a fly rod is not my thing, particularly when throwing a ten weight with intermediate line. The water on the sand flats where we were fishing was so clear, you would swear you were in the Gulf or the Bahamas. The sharks, and there were some big ones, swimming just beyond the surf looked just like the sharks you see on the flats in the Bahamas or in the Gulf. They also made me think twice about wading in water much deeper than my knees. After the water came in, so did the red fish. I spied one school of about twenty nice fish, cast my Striper Swiper in front of the school, and it was attacked by a 27" Red. What fun! After fighting and releasing that fish, I spotted another school, and repeated the drill. Another nice red hit the Striper Swiper. John chased the school and managed one more fish out of it before John, me and all the sharks attracted by the fighting fish really spooked the school. This was a real treat for me. If you are interested in a trip like this, just let me know. I will be glad to refer you to Capt. John Bottko. Striper Swiper and Surf Caught Red Fish. Notice how silver he is. 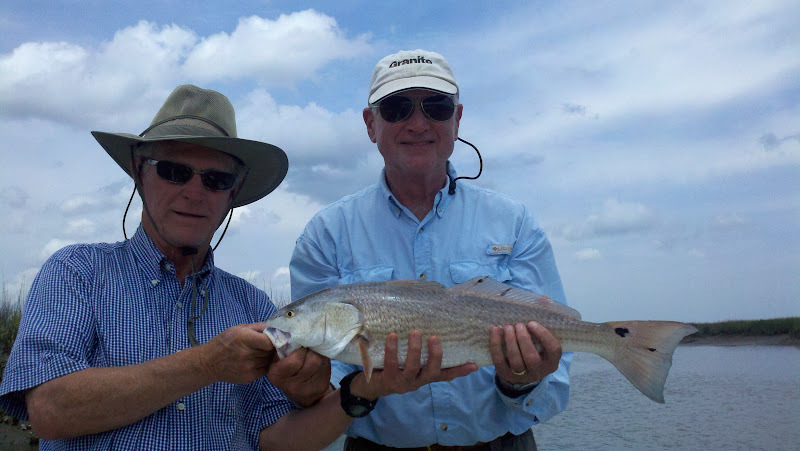 Reynolds and Bill have been fishing together for over forty years. Old friends are priceless. April and the first part of May have been all about red fish and triple tail. Most all of my fly fishing clients are interested in sight fishing, and these two fish offer the best opportunity at this time of year. In April we had a great tides for sight fishing. During the middle of the month we had tidal movements of less than six feet, which meant clear water in the Marshes of Glynn. Combine clear water with early morning low tides, and the fishing can be amazing. See the pictures of Rod and Tom in the story below. We are still experiencing some cold fronts moving through St. Simons. It is usually windy in the back side of these fronts. The rain and wind muddy the water, which can make the fishing tough. We had a few days of tailing tides the first of April on the Super Moon. I didn't fish, but just scouted these tides. The fish were tailing and grubbing for crabs. The tailing red fish fishing should be great during the full moon the first few days of June. The wind and super high tides that accompanied the Super Moon really made the water muddy for about a week. If we are faced with this challenge while fishing, I usually try big, dark flies or large purple/black Puglisi patterns. Sometimes it works and sometimes it doesn't. Fishing in water cloudier than coffee with cream is challenging. However, water is clearing now, and fishing the rest of May should be great. The Triple Tail have been sporadic in front of Jekyll. Some days we see a lot of fish, and other days we don't see many. My clients haven't had any luck hooking them on the fly in the last few weeks. Maybe the SW winds forecast for the rest of this week will bring some TT to the boat for my flyfishermen. There was a good trout bite reported on Cumberland beach right before the new moon, and a consistent trout bite on the back side of Cumberland. The trout bite in Hampton River and Village Creek area has also been good. The bite in the St. Simons Sound has been sporadic. With June coming our weather should soon stabilize. I hope the front that passed through here a few days ago will be our last until late September. The red fishing will remain consistent on the low tide and the high tides on the full moon in early June should bring good tailing activity. If you are coming to St. Simons over the next few months, please go ahead and reserve your days as I am beginning to book up, particularly around July 4th. I love it when I have families on the boat. Rod flew in from the West Coast for a short fishing trip and visit with his son Tom, who has recently returned from Iraq and is stationed at Ft. Stewart. There is no better way to spend time with family than on the water. Both of these guys are accomplished fly fishermen, but Tom had never fly fished in salt water. We started off early in the morning for the red fish flats. The fishing started a little slow, but after the tide started coming in, the schools of red fish came in with it. At the end of about four hours of fly fishing, we had seen hundreds of red fish. 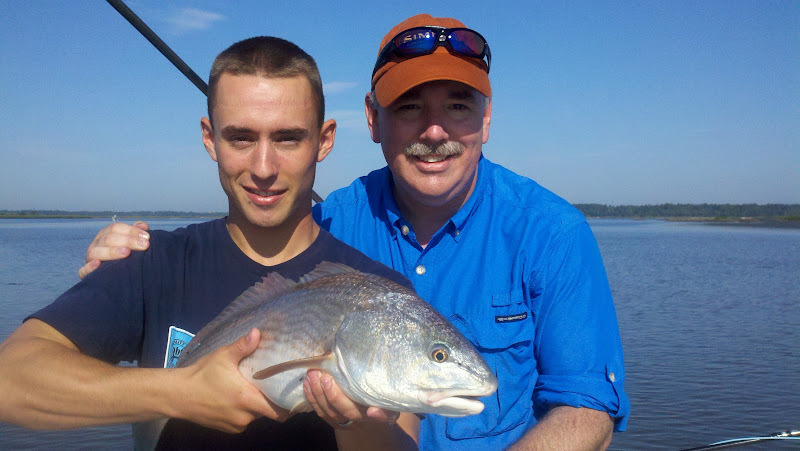 The father/son team had boated four red fish from seven to nine pounds and missed several others. We ended the day with about an hour of fishing for Triple Tail. We saw a few, but these fish are funny. Some days you see a bunch and they will eat a fly. Other days, you won't see any or they refuse everything. This was a day when we only saw a few, and they wouldn't eat anything. 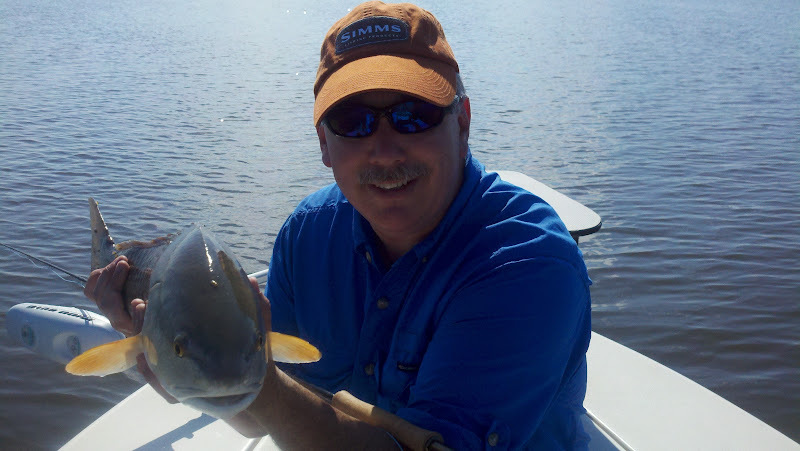 Regardless, Rod and Tom had an exceptional day of ,"Hunting Fish in the Marshes of Glynn." Some of my Face Book friends might have seen these pictures, for that I apologize, but this was a great fishing trip.